Source: Konica Minolta Sensing Americas, Inc.
With the current increasing focus on renewable energy, solar cells (photovoltaic cells) are in the spotlight. As companies strive to improve the performance and characteristics of solar cells, it is necessary to perform evaluation of each product under standard test conditions. For accurate measurements, it is necessary to utilize a reference photovoltaic cell with a calibrated short-circuit current to adjust the intensity of the solar simulator to be used for measurements. Konica Minolta Sensing’s Filtered PV Reference Cells have the industries best accuracy and stability (in accordance with JIS C8904). The AK-140 can be used with the AK-120 and AK-130 for triple junction cells or as a standalone reference. All AK series Reference PV Cells come ready to use right out of the box with a PT-100 temperature sensor and a test report of short circuit current (Isc). They can also be delivered with calibration traceable to AIST. By employing the high-accuracy optical filter technology cultivated for our color-measuring instruments, we have succeeded in greatly reducing spectral mismatch, which had been a major problem with conventional cells. Spectral mismatch can be suppressed to 1% or less, even when evaluating solar cell performance using JIS C-8942 Class C solar simulators. Standard reference cells using optical filters typically have low durability against exposure to solar simulator light. This causes changes in characteristics due to the effects of light exposure (solarization) making accurate measurements difficult. AK series Reference PV Cells have a high durability against exposure to light, greatly reducing solarization and ensuring stability. Error in short-circuit current (Isc) due to multiple reflection is greatly reduced. Improvements in the optical structure suppress multiple reflections and reduce the 1.3% error of conventional products to 0.0%. 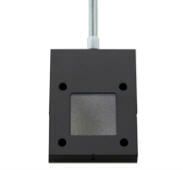 A PT-100 temperature sensor is integrated into the package of the AK series cells, and can be connected to a temperature-controlled stage for reference PV cells to easily achieve and maintain the standard test condition (STC) of 25°C. Every AK series cell includes our Spectral Mismatch Software. The software can be used to determine the spectral mismatch between the AK Series PV Cell and any manufactured solar cell.